Categories: Allergy relief, Devices, Tapes, etc. The Allergy Kit - The Pet Allergy Kit Treats most common allergies to food, toxins and vaccines plus dog and cat. The Allergy Kit includes a 635nm Healing laser. The laser contains light emitting semiconductor chips driven by a low voltage power supply with a wavelength of 635nm. Laser at this wavelength is the exact vibration of a healthy living cell and easily stimulates acupuncture points. "The Allergy Kit is the culmination of continuous research since 2002, to create an easy, practical way to treat allergies at home. We developed this method as an alternative to NAET. It is based on the treatment of thousands of acupuncture patients. Each Kit contains a Red Cold Laser and imprinted vials formulated by Dr. Ynge. The laser balances the acupuncture meridians in the presence of the allergen(s). This natural allergy treatment is designed to reprogram the body to react normally to the allergen instead of reacting to the allergy symptoms. 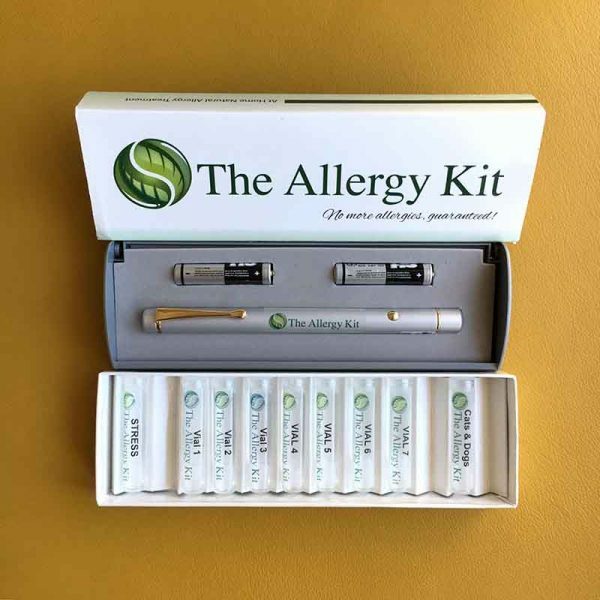 The Allergy Kit allows you to eliminate your allergies, take control of your health and teach your body to respond in a healthier way to stressors. Unlike NAET that treats only one allergen at a time, The Allergy Kit targets multiple allergens in each vial. Vial 1: treats chicken, egg, milk, cheese and other dairy products, calcium, vitamin C and parasites in the first treatment and also balances the Brain/Body. After finishing vial 1, many persistent problems vanish like magic. Digestion improves, phlegm and stuffy noses lessen and behavioral problems disappear. Vial 2: treats sugar and B vitamins. Almost everyone is allergic to sugar in one form or another. And since sugar is in almost all processed foods, you’ll feel better after treating yourself with vial 2. We’ve found a connection between B vitamins and sugars that causes addiction problems. Many people treated with vial 2 lose the desire for sugars and lose weight. Since sugar is in almost everything, it is a good idea to re-treat vial 2 regularly, maybe monthly or when you start to get sugar cravings again! Vial 3: treats heavy metals, pesticides, herbicides, toxins and petroleum products. The body, when allergic to toxins cannot fully identify them and rather than expel them from the body, buries them deep inside the fat cells. After being treated for vial 3, you may be able to detox easier and keep the weight off that you lose. Vial 4: treats vaccines and childhood vaccinations. When you’re allergic to either the vaccine itself or any of the ingredients that are in the vaccine, it affects your brain and behavior. Many children have a very positive improvement in concentration, better behaviors common with ADD and ADHD improve. Vial 5: treats sugars again, but this time with candida. Sugar is so important that we have to treat it twice. Candida is a fungus found in the human digestive tract, mouth, and genital region. Under normal circumstances, levels of Candida are controlled by beneficial bacteria. However, if the bacteria-fungus balance is upset, caused primarily by the use of antibiotics or if the immune system is compromised, an overgrowth of Candida will occur, resulting in infection, foggy thinking and exhaustion. Vial 6: treats wheat, gluten, grains including pasta. Since most of these are seeds, there is a survival mechanism built into many of the seeds that keep them from being digested by the birds and other animals ensuring that they will pass through the digestive tract whole and be able to grow and continue the life cycle. That’s why we have serious digestive problems with many grains and seeds. Wheat has been modified to be easier to grow, but harder to digest. Many problems associated with wheat include arthritis, digestive problems, leaky gut and concentration issues and also behaviour problems like in autism and/or Alzheimer’s and the like. Vial 7: is a combination of vials 1 through 6 and also includes organs and endocrines. Vial 7 finishes the process and treats food combination allergens. Since we eat foods together, it is important to treat them together in the same vial. After you’ve treated yourself with The Allergy Kit, your immune system will get stronger! Strong enough to move onto airborne allergens, bug bites, things applied to your skin and whatever else you might come in contact with." The manufacturer has a 90 day money back guarantee. Refer to the video in the kit.